The National Chairman, Peoples Democratic Party (PDP), Mr Uche Secondus, has condemned Tuesday morning security siege on the Abuja residences of Senate President, Bukola Saraki and his deputy, Ike Ekweremadu. Secondus in a statement issued on Tuesday in Abuja described the development as “attack on democracy, using state security apparatus’’. He said that Directorate of State Services (DSS), Army and the Police had attacked the National Assembly with the aim of forcibly overthrowing its leadership and rendering it comatose. 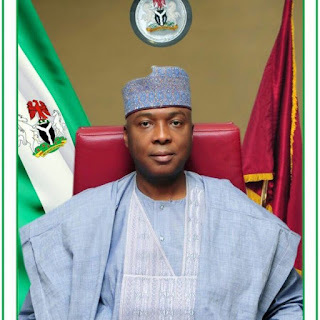 “The Senate President, Dr Bukola Saraki, his deputy, Ike Ekweremadu and other distinguished senators are currently under severe assault from security agencies. “It is now a known fact that democracy have now collapsed in Nigeria and we are now under a totalitarian and fascist government with no appetite for opposition,’’ Secondus said. Similarly, a former Vice President, Atiku Abubakar, in a statement by his Media Office also called for stop to the persecution of national assembly leadership. “No democratic nation ought to treat the leadership of its parliament like common criminals in the course of a political disagreement. “I remind the powers that be that on Aug. 31, 2013, when Sen. Bukola Saraki walked out of the PDP and began the process of joining the All Progressives Congress, there was celebration in their camps. “I also remind them that their electoral victory, which they have so badly mismanaged today, would not have been possible without the Senate President. “Power is transient and is also a trust that should only be used for the good and advancement of the people one leads and not for the persecution of real and imagined political opponents. Abubakar urged President Muhammadu Buhari to live up to his words after Saraki’s ordeal which was brought to a halt by the Supreme Court.